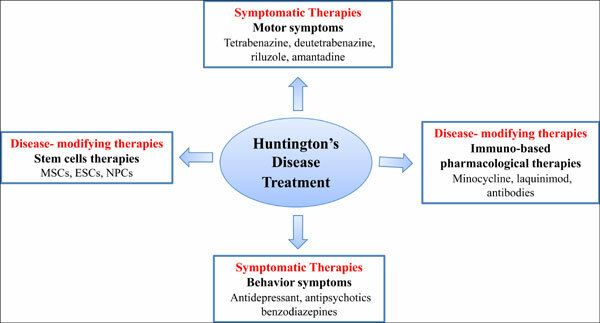 Background & Objective: Huntington's disease (HD) is an autosomal-dominant, progressive neurodegenerative disease characterized by selective loss of neurons in the striatum and cortex, which leads to progressive motor dysfunction, cognitive decline and behavioral symptoms. HD is caused by a trinucleotide (CAG) repeat expansion in the gene encoding the protein huntingtin. Despite the fact that the HD gene was identified over 20 years ago, there is no effective disease-modifying therapy for HD and only symptomatic therapies are available to date. Recently, new agents and procedures have been investigated for HD and many of them have focused on immunomodulatory and/or anti- inflammatory strategies. Conclusion: The objective of the current review is to summarize data on the therapeutic strategies to treat HD that are based on immunomodulatory effects. Huntington's disease, inflammation, treatment, symptomatic therapies, disease modifying treatment, stem cells.